Note to self: Don’t ever bring a cake to a luncheon, small groups event, or any type of potluck unless I’m prepared to bring it with a slice (or two or three) missing. The way I like to cook, I like everything to look presentable. Many times, the way the food appears on the plate or in the dish influences whether or not people will try your food. It’s amazing how much more appetizing food looks on a simple white plate as opposed to a paper plate. That’s why when bringing food to a luncheon or potluck, I like my food to look attractive. Well, Matt didn’t exactly grow up the way I do. He doesn’t care if a cake has a piece or two missing from it, or if he’s eating it with a plastic fork and paper plate. He just cares about the food! Me on the other hand, I hate using paper plates and only use them for cutting fruit or eating a PB&J. So, as I bring this cake to our small groups tonight, this is the reason why there’s a few pieces of cake missing. I always tell people that Matt had to do a little “quality control”. 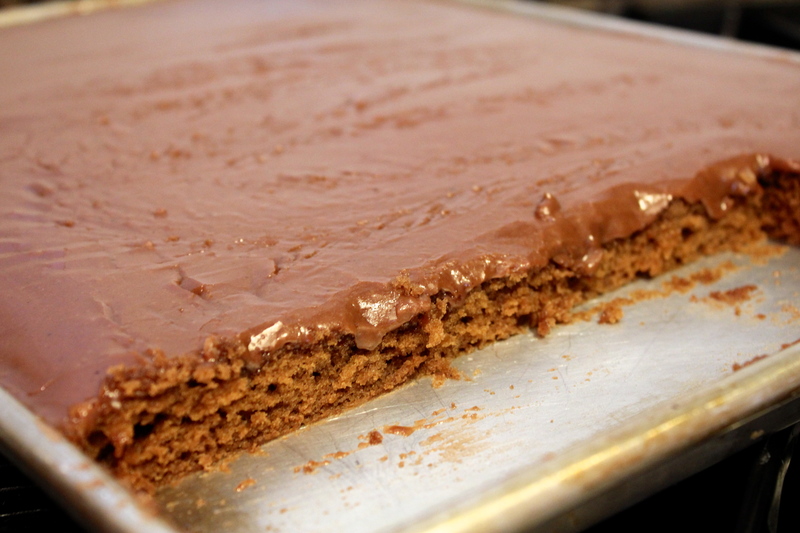 This Texas sheet cake is my sister-in-law Leah’s recipe. 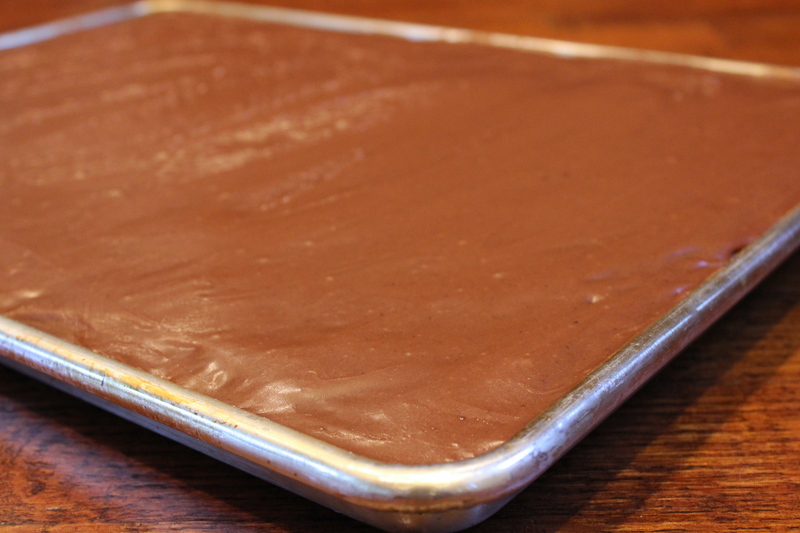 Many a times I’ve been over to visit and there’s a freshly prepared Texas chocolate sheet sitting out on the island. It’s one of Leah’s signature desserts that she makes for her husband Jeffrey and the rest of us. Leah even has a vanilla version of this Texas sheet cake, which is outstanding! As evidenced by the missing pieces, this cake is best when it’s hot. Nothing beats a warm chocolate cake, drizzled with hot, chocolatey, sweet frosting on top. It’s almost like eating chocolate pudding! Pour yourself a tall glass of milk, and you’ve got yourself quite a dessert. Bring to a boil 2 sticks butter, 4 Tbsp. cocoa and 1 cup water. Pour it over the flour mixture and add the remaining ingredients. Bake at 350 degrees for about 20 minutes, or until done. While the cake is hot, pour the frosting on top. The icing is still hot! In less than 5 minutes, one whole row has been eaten! 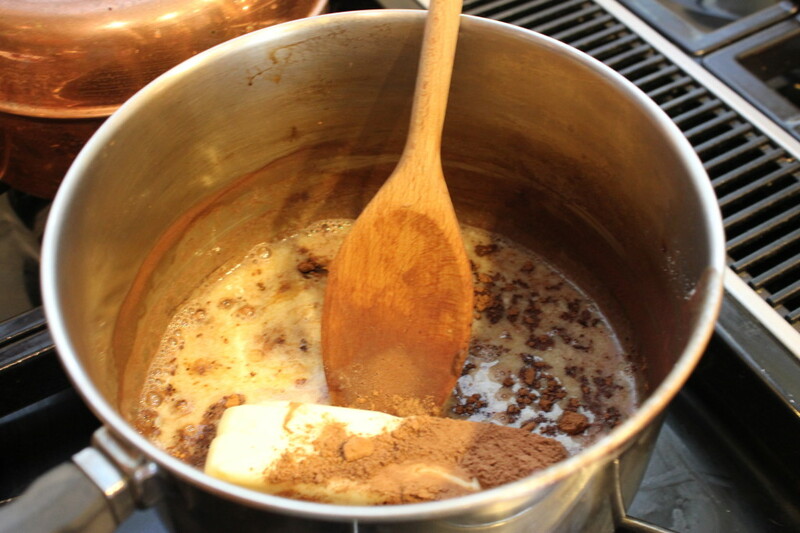 FOR THE CAKE: Place 2 sticks of butter, 4 tablespoons cocoa, and 1 cup water over medium heat and bring to a boil. Pour over flour and sugar mixture. Mix well. Add eggs, buttermilk (or sour cream), baking soda, salt, and vanilla. Mix well. 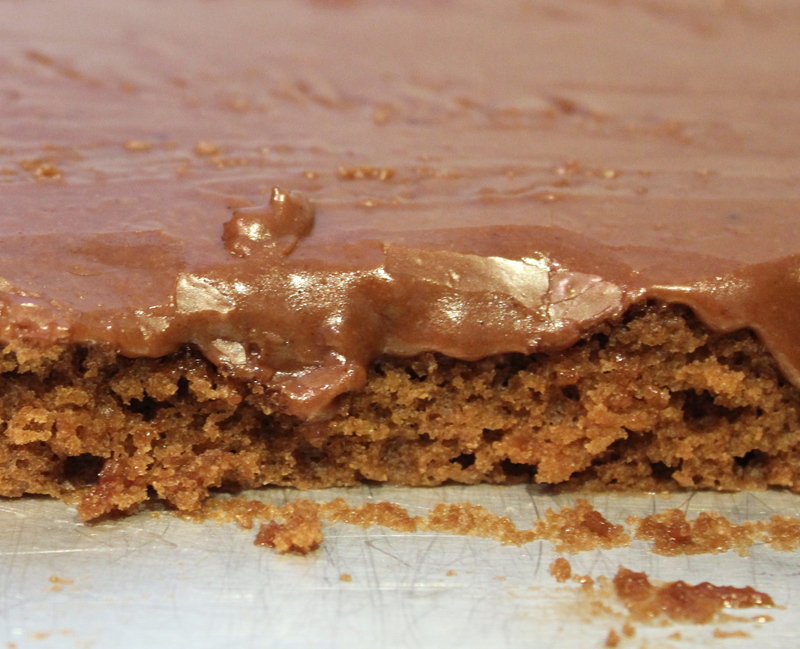 Pour into a greased and floured cookie sheet pan (15½ x 10½ inches). My pan was slightly larger; about 18 x 12 inches. Cookie sheet must be a deep cookie sheet pan. 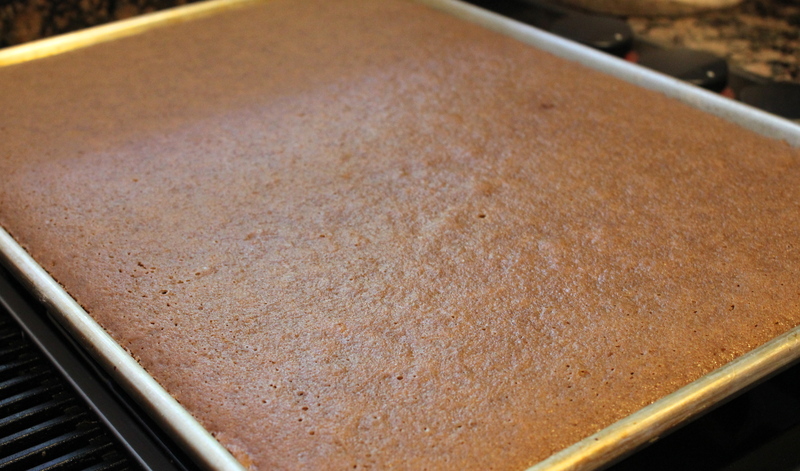 Bake at 350 degrees for 20 minutes, or until a toothpick comes out clean from the center of the cake. Ice while cake is hot. FOR THE FROSTING: Five minutes before the cake is finished, make frosting. Mix together butter, cocoa and milk. Cook over medium heat and bring to a boil. Remove from stove and add powdered sugar and vanilla. Mix well. Pour over cake while hot. 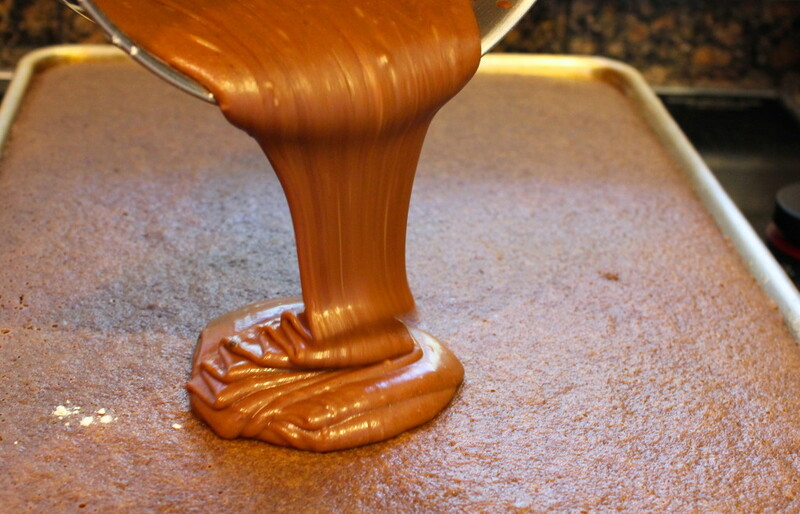 13 Responses to "Leah’s Texas Chocolate Sheet Cake"
The recipe doesn’t have the amount of salt to add. Are you sure I can use the larger sheet pan. Thinking I should make 1 and 1/2 recipe. Just made this for my son’s birthday party 🙂 I stuck my finger in to make sure it tastes like my mom’s! Pretty close! Thanks for making my night! What I only have a 9×13 cake pan? You can still make it. Just increase your baking time to about 30 minutes. One of the best Texas sheet cakes I have ever had! Every time I make this people rave about how yummy it is. It’s the perfect dessert for a crowd. I always use it when I need to bring a dessert and don’t know how many people there will be. This cake was AMAZING! I made for a barbecue this weekend and everyone loved it! Bonus points because it tasted just like my mom’s! So glad it was a hit and that it reminded you of your moms. Comfort food is the best! Yay! So glad you enjoyed it and the peanut butter addition sounds amazing!